Skills is where it's at folks and now is a good time to begin tapping into things that you can do or always wanted to. Getting hired is tough but owning your skills and making a living out of them is liberating. It's been 6 years since I worked for someone else and the only reason I did, was to learn a business I was just getting into 3 years before that, but once I learned everything I wanted, I got out and made a way for myself. Having ownership over my esthetics, massage therapy, art business, marketing and speaking skills has been nothing short but a breath of fresh air because nobody in the world can take that away from me. I own it and it was up to me to make a living out of the things I love to do. Some are self starters like me and others just need to tap into it more. Maybe punching a clock gives others more of a relaxed feeling, but always have a back up skill, to get you over while trying to find another position if for whatever reason something happened to the last position. Being a single mother made me who I am and brought out all of my entrepreneurial traits because my only intention was to have as much time with my kids and seeing them grow up and the only way I felt I could fulfill that goal, was to have more control over my schedule and that's exactly why I chose my path. It's not always easy making your own money and there are times when it does get hard seeing days when you don't get paid but it always evens out at the end. The days I do make money make up for the times that I don't and it always keeps reminding me why I love my life and more importantly my freedom. To be home and to make dinner for my boys was always on my top list of priorities and I created a life in which I could do just that and give them a home in which I can look around and be proud of all I did and still do because one day, I will be sharing dinners and holidays not only with my sons that are now all grown up but one day with my future daughter in laws and grand babies. My job is not finished. My dream is still going and I feel like I am just getting started all over again. My friend, Maureen, always says, "keep dreaming even if it breaks your heart." Never stop folks no matter what. 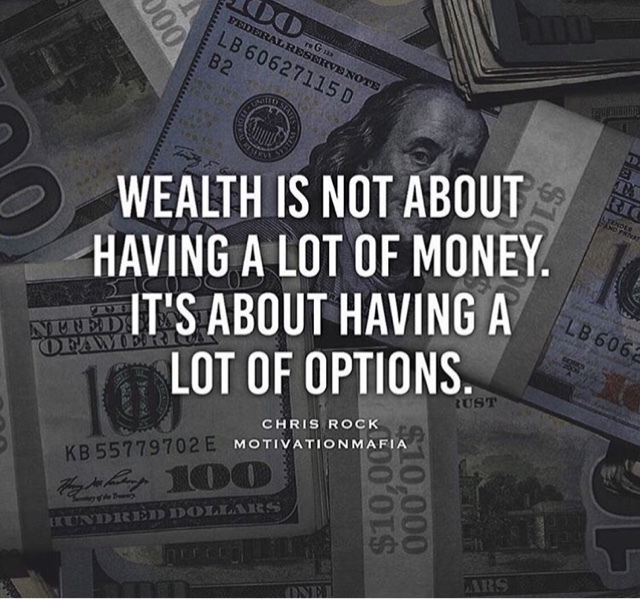 Wealth is having options. It's not just about having a lot of money. Begin finding an option or two today.